"The former aide, James A. Wolfe, 57, was charged with lying repeatedly to investigators about his contacts with three reporters." "The seizure was disclosed in a letter to the Times reporter, Ali Watkins [formerly of BuzzFeed], who had been in a three-year relationship with Mr. Wolfe." It’s not true President Trump doesn’t read. It’s just exceptionally hard to get him to do it. President Obama had a formal system for his homework book, which he would devour and send back to the staff with detailed notes in the margin, scrawled in his left-handed backhand. With President Trump, “The Book” is sometime a notebook, sometimes a stack of papers with a big clip, and sometimes a stack of folders. 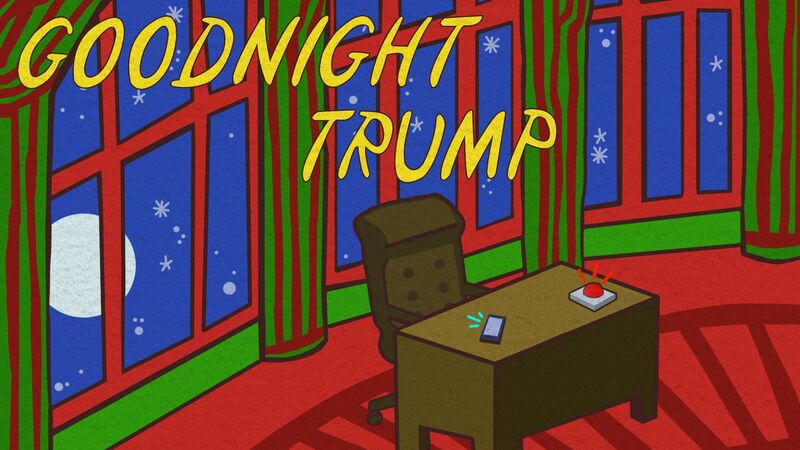 “The Book” typically includes briefing sheets about events the president will attend the next day; his schedule for the day, week and month ahead; and a sheaf of policy papers. 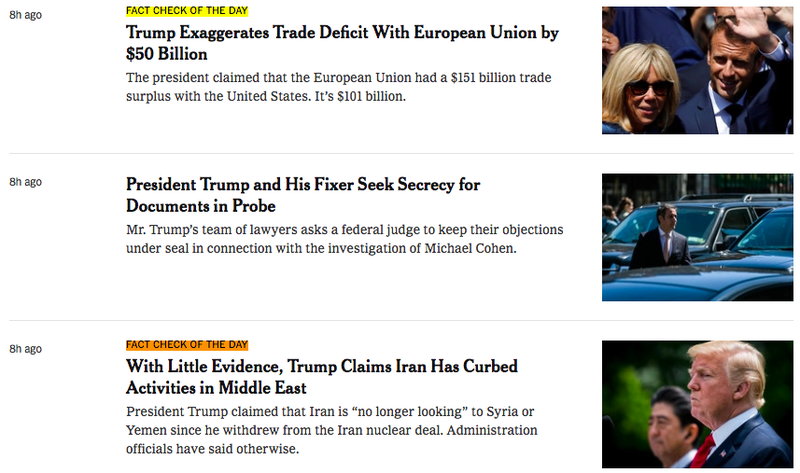 Separately, the press and communications staffs assemble clippings — often positive, to contrast the bad news he may be seeing on cable news. '“If he reads something in the press, like if he sees it on TV, that grabs his attention,” said a source close to the president. The packet can even include screen grabs of cable news chyrons. The president demands brevity, refusing to engage with briefers like his former national security adviser, H.R. McMaster, who’d come in with a PowerPoint deck dozens of pages long, filled with text. “He used complete sentences!” said one person who saw the briefings, and knows better about how Trump likes his information. Trump got so exasperated with McMaster that he’d look at other papers on his desk while the national security adviser was talking — his view of an alpha male move to show that the general was failing to interest him. The more effective approach with Trump is to use simple, short bullets, or a graphic or timeline — anything demonstrative. The bullets are so pithy that one source said they're "basically slogans." The president still savors his print newspapers — usually New York Post first, New York Times second and Washington Post third. He also occasionally reads the deal coverage in The Wall Street Journal and The Financial Times. And he likes Wall Street Journal editorials. As Trump did back at Trump Tower, he'll mark up articles with a Sharpie, and direct them to various aides and Cabinet secretaries. It's more complicated now than when his personal secretary would send around PDFs. Now the clips are presidential records, and so have to be tracked. Trump may flip through "The Book" during his "executive time," the hours of the morning reserved for tweeting and watching TV. White House chief of staff John Kelly added the time because Trump complained about how busy his schedule was. Now Trump is used to the time and likes it, even though some aides would like to cut it shorter. One source familiar with the president's calendar said: "There's no going back." Be smart: White House officials find it as difficult as ever to get real news and real facts into the president's hands and head once he's spooled up about a specific idea. This is where the slogans come in handy. Wolff tells me he has signed with the same publisher, Henry Holt, for a sequel — although he says it's unclear what that means: His best sources (including Steve Bannon) have left the White House. And he's lost the element of surprise that came with his soothing technique of acting as curious therapist to tortured, befuddled aides: I'm just listening! Tell me what it's like! "Fire and Fury" — with its mix of explosive insider quotes and inaccuracies that drew ridicule — sold a record-shattering 2 million copies in the U.S., and nearly as many abroad (700,000 in the U.K. alone). As for his plans for Part Deux, Wolff told me: "It's untitled, unscheduled, unfocused." And then the wry coup de grâce: "It'll obviously deal with American politics at this point in time." Washington Capitals fans cheer during the fan watch party at Capitol One Area in D.C. last night. " Alex Ovechkin and the Caps put years of heartbreak behind them by winning the Stanley Cup for the first time, defeating the Vegas Golden Knights 4-3 in Game 5 of the Stanley Cup Final at T-Mobile Arena" in Vegas. WashPost banner headline: "At last, Capitals hoist the cup." "26 years: period since Washington had won a championship in a major professional sport." 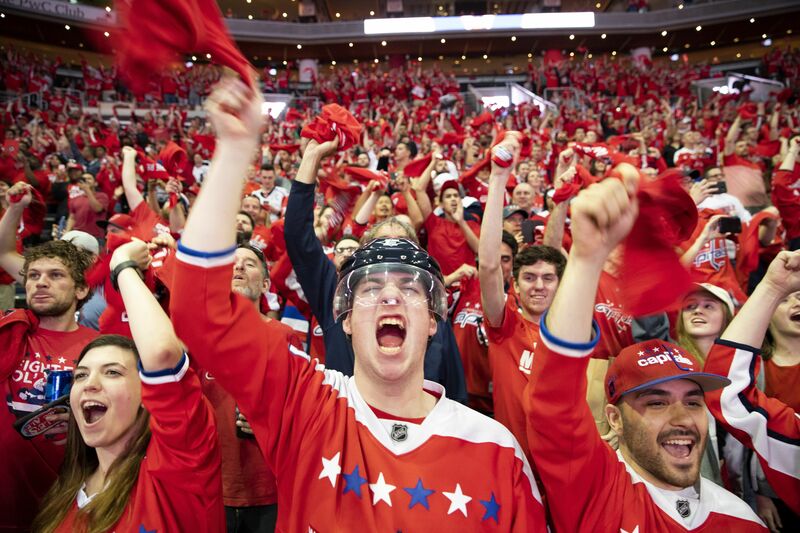 "44 years: Washington's hockey team came into existence in 1974." "15 goals: Alex Ovechkin's total for the playoffs." 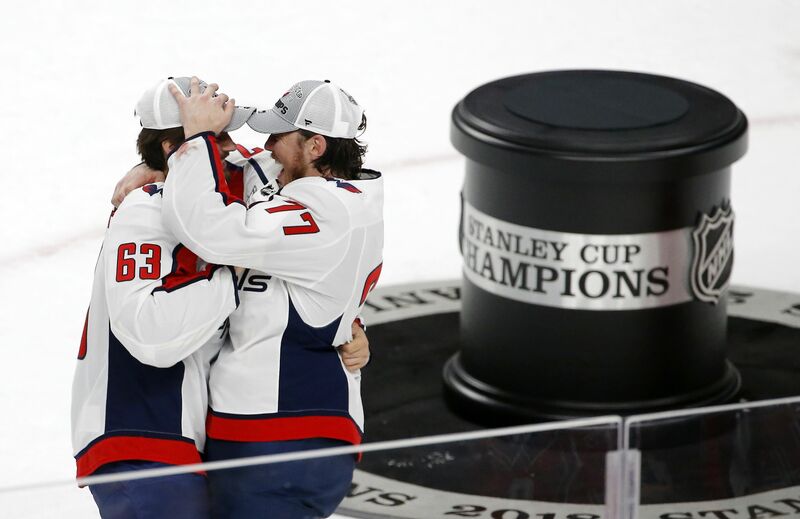 "T.J. Oshie found his father on the ice amid the jubilant madness of the Washington Capitals' postgame celebration and wrapped him in a fierce hug." "Five years after he was diagnosed with Alzheimer's disease, Tim Oshie's memory is inconsistent and cloudy." "Anyone who saw the depth of emotion in his Stanley Cup-winning son's eyes ... will never forget it." Why it matters: "Right after Oshie won his first NHL title in the Capitals' 4-3 victory over the Vegas Golden Knights, the veteran forward's thoughts were on his family — particularly his father, who fostered his son's love of the sport as a coach and a hockey dad in Everett, Washington, north of Seattle." "My dad, he doesn't remember a lot of stuff these days," Oshie said, his voice choking with emotion. "This is one memory that I don't think he's going to forget." "Moments later, Oshie found him. Tim had watched the game alongside his sister and daughter in the T-Mobile Arena stands." 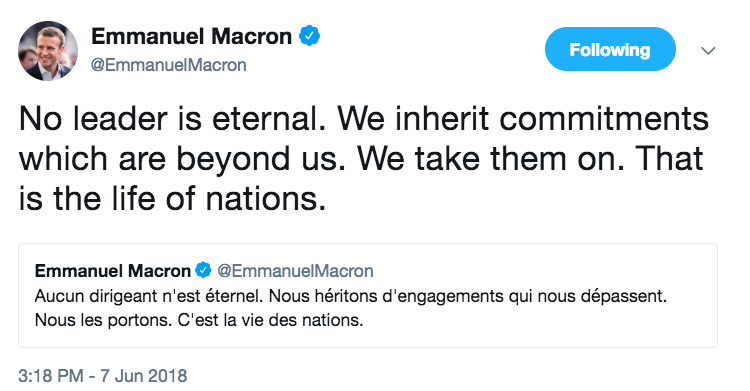 Shot — WashPost: "French President Emmanuel Macron ... threatened to join with other world leaders to issue a rare rebuke of the United States at a global summit here this weekend." Chaser — Wall Street Journal: "The White House said ... Trump would leave the Group of Seven summit earlier than planned, as a dispute erupted ... between Mr. Trump and two of America’s closest allies over the U.S.’s trade stance." Quote"I’m very well prepared. I don’t think I have to prepare very much. It’s about attitude. It’s about willingness to get things done." "[N]ext week in Singapore President Donald Trump and Kim Jong Un crown their summit with a pledge to rid the Korean peninsula of nuclear weapons. A few days later America and China step back from a trade war, promising to settle their differences. And in the summer, as sanctions bite, the streets of Tehran rise up to cast off the Iranian regime." "These gains would be striking from any American president. From a man who exults in breaking foreign-policy taboos, they would be truly remarkable. But are they likely? 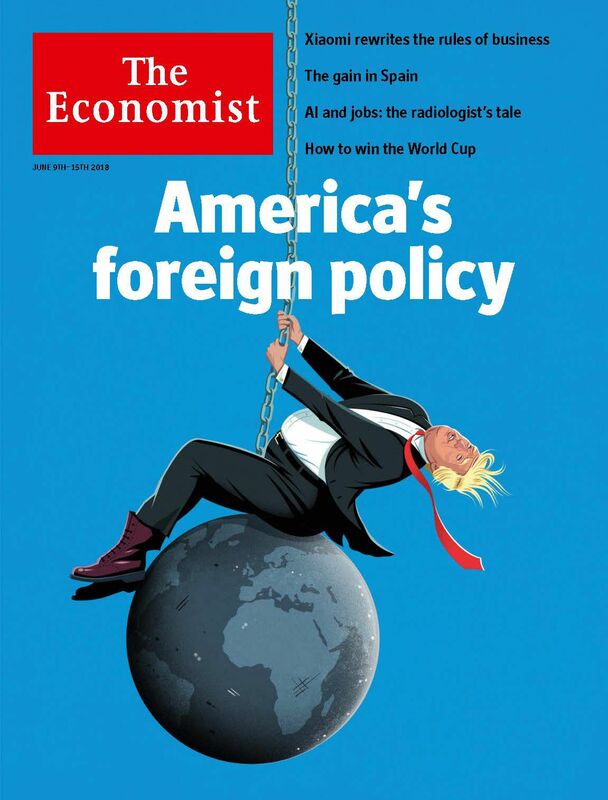 And when Mr Trump seeks to bring them about with a wrecking ball aimed at allies and global institutions, what is the balance of costs and benefits to America and the world?" "In the short term some of Mr Trump’s aims may yet succeed. Iran’s politics are unpredictable and the economy is weak. Mr Kim probably wants a deal of some sort, though not full disarmament ... On trade, China would surely prefer accommodation to confrontation." "Yet in the long run his approach will not work. ... [R]ules help deter aggressors, shape countries’ behaviour, safeguard American interests and create a mechanism to help solve problems from trade to climate change." "The tactic [partly about gaming search results] has successfully landed vaping brands on the sites of some of the nation’s best-known universities, including Harvard." "It also has drawn criticism that the scholarships are a thinly disguised ploy to attract young customers." Why it matters: "The grants have emerged as high schools struggle to rein in booming teen use of the devices, sometimes threatening students with suspensions or installing alarms that can detect the devices’ discreet vapor." "The scholarships, ranging from $250 to $5,000, mostly involve essay contests that ask students to write about the dangers of tobacco or whether vaping could be a safer alternative." "[T]he grants have been posted online by e-cigarette retailers and review websites such as Slick Vapes, SmokeTastic and DaVinci Vaporizer." "Harvard and California State University at Long Beach immediately removed the listings after being asked about them by the AP, saying they had been posted inadvertently." Read them here and here. The "priceless collection of more than 145 million items ... includes thousands of human skeletons, countless stuffed mammals, birds and other vertebrates, indigenous cultural artifacts from around the globe and a massive shed full of pungent whale bones." "Less than 1% of the museum’s collection is on display; much of the rest is at the Museum Support Center [in Suitland, Md.] — boxy buildings with windowless facades that provide 735,000 square feet of storage, office and laboratory space, about 6 miles away from the stately museum building on the National Mall." "If the U.S. government needed a place to store the Ark of the Covenant after Indiana Jones rescued it from the Nazis in 'Raiders of the Lost Ark,' it would likely wind up at the Museum Support Center. The museum staff claim they don’t have the ark, but they hear about it enough that they keep a miniature model on hand to joke with the occasional VIP visitor." "The collections staff roll their eyes when visitors liken the facility to America’s attic. 'This is not an attic,' said Carol Butler, assistant director for collections. 'It’s planned, it’s organized, it’s orderly.'" As my Grandma Powers would say: So there! Thanks for starting the day with us. 24/7 updates on Axios.com.